The Scent Of Happiness — A lesson in pleasure seeking. Lord Caitanya (wearing yellow dhoti) predicted that the chanting of Hare Krsna would spread to every town and village in the world. Delhi, India—To commemorate the five-hundredth anniversary of the appearance of Lord Sri Caitanya Mahaprabhu, ISKCON devotees from all over the world have arrived in India to participate in the most extensive festival program they have ever undertaken. The eighteen-month-long festival, known as a pada-yatra, or “walking festival,” is traveling a four-thousand-mile pilgrimage route, passing through all the holy places Lord Caitanya visited on His South Indian tour. The pilgrimage began on September 2 in Dvaraka, a holy town on India’s northwest coast. The devotees walk about twenty miles each day, arriving by midday at appointed festival sites in villages and towns along the way. 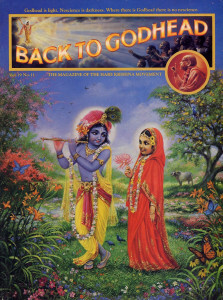 There they are met by a caravan of trucks carrying tents and other supplies, and by evening they have organized a celebration—music, chanting, prasadam (food offered first to Lord Krsna), and displays showing how Lord Caitanya is currently being worshiped in all ISKCON centers worldwide. The pada-yatra will culminate at Lord Caitanya’s birthplace, Mayapur, West Bengal, in March 1986, the five-hundredth anniversary of Lord Caitanya’s appearance. Lord Caitanya is the Supreme Personality of Godhead, Krsna Himself, appearing in the role of His own devotee to teach everyone how to best engage in devotional service. Lord Caitanya taught that, since God is absolute, we associate with Him directly by chanting His names; thus we cleanse our hearts and reawaken our eternal loving relationship with Him. 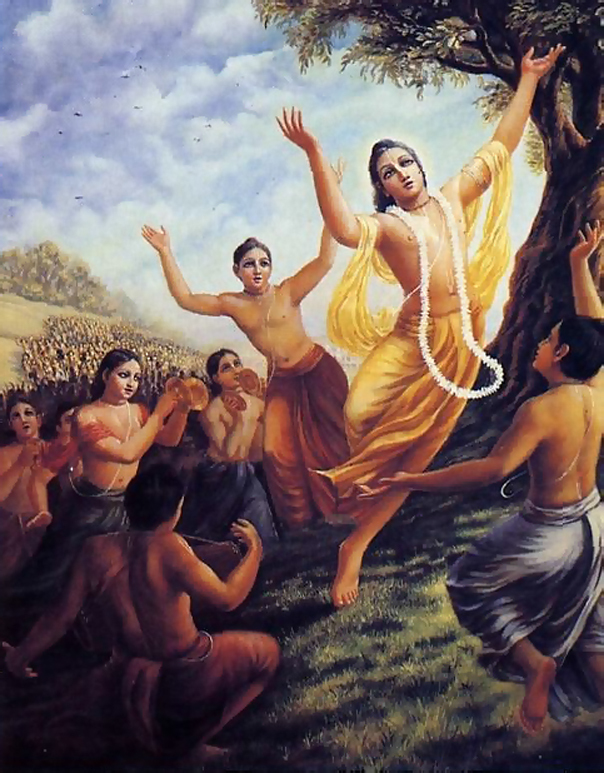 Five hundred years ago, while traveling throughout India, Lord Caitanya established sankirtana—the practice of congregationally chanting and glorifying the names of God—as the prime means of God realization in this age of quarrel. 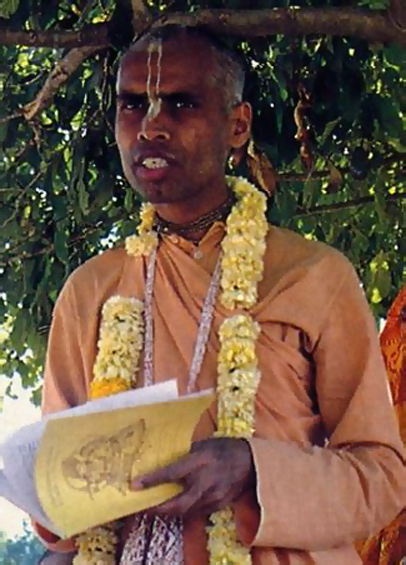 Lord Caitanya predicted that the congregational chanting of the holy names would spread to every city, town, and village in the world, and by traveling on foot from village to village. He set the example of how to implement this prediction. By the grace of Srila Prabhupada, the founder and spiritual master of ISKCON, Lord Caitanya’s sankirtana movement is now active and growing on five continents. The inspiration for the pada-yatra came largely from Srila Prabhupada’s English translation of Sri Caitanya-caritamrta, a sixteenth-century Bengali text by Krsnadasa Kaviraja Gosvami, which contains extensive descriptions of Lord Caitanya’s travels throughout India. In his commentaries on this book, Srila Prabhupada provides further, present-day information about the exact locations and the historical significance of the villages and temples visited by Lord Caitanya, often explaining how to reach these places by train and on foot. These detailed descriptions have created an intense interest in Lord Caitanya’s life, and thus devotees and other interested persons from all over the world will join the pada-yatra to retrace Lord Caitanya’s footsteps. 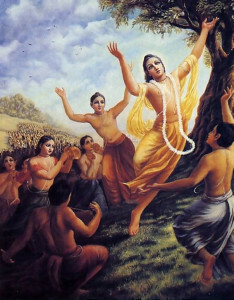 In India, where sankirtana has been practiced for centuries, the international pilgrimage is expected to create excitement, since most villagers are as yet unaware that Westerners have adopted the chanting of Hare Krsna. In addition. ISKCON public affairs offices will broadcast the progress of the pada-yatra to the international media. Says His Holiness Lokanatha Swami, festival organizer and a native of India: “By witnessing this grand festival, the local people will gain renewed enthusiasm for chanting the names of God. People in the villages will see that the chanting is also being practiced by people from affluent Western countries.